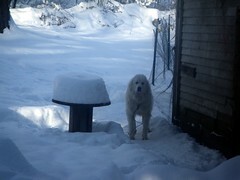 I’m so sad that winter got here before we were able to get in more fencing that will contain the Pyrs. If it had waited just two days, we had a pack of people willing to help pound fence posts and run fence. We have the posts, we have the rolls of fence, we have the electric to put at the top … but mother nature dumped almost two feet of snow so it’s just not possible to make happen. We have a small paddock next to a barn stall with some fence with a hot wire across the top. It held Buffy and Faith for almost a week before it failed. We thought the fence must be shorting out somewhere, but no, they just don’t care. So then we put Maggie and Buffy in there together, and tethered Buffy. Maggie won’t jump, Buffy doesn’t do well alone, but even that won’t keep Buffy from jumping. She still jumps but at least with the tether, she can’t go far and isn’t in distress. It puts her behind the barn, though, so she can’t see what’s going on and she’ll start to whimper whenever something interesting happens, so I at least know what she’s done. Faith is tethered on a run near the house and is fairly happy about it. She can actually do some running and playing and can see the front of the house which is much better for her, plus she can see Buffy. Still, it’s going to be a long winter having to manage them this way. They are all so used to having much more freedom so it’s going to take a lot of adjusting for all of us. Their fascination with the road is just too dangerous. It’s a fairly busy state highway and windy and twisty. The last thing an unsuspecting driver needs is a big white fluffy beast jumping out and chasing them, which is what they want to do. So I’m making lists of priorities for the spring already. As soon as we can pound some posts, fence is first on the list.